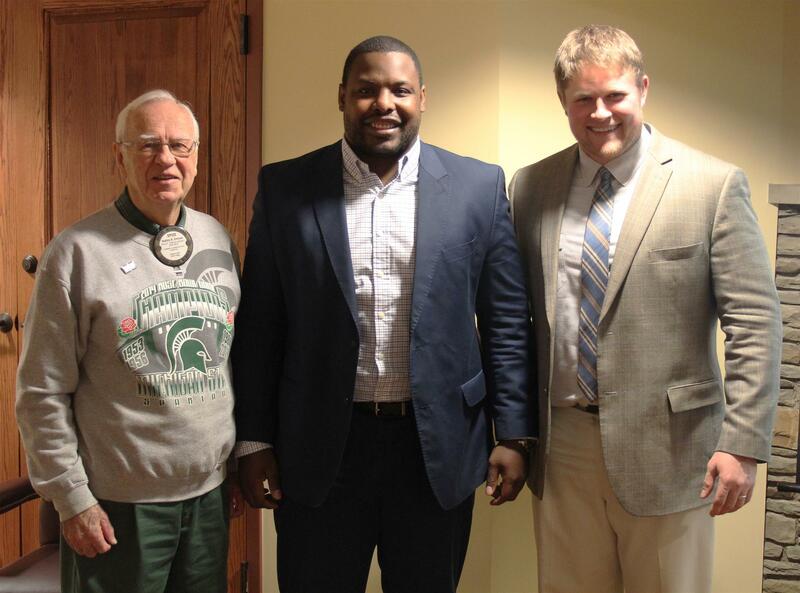 Pictured (L to R) - Spud Ericson (MSU alumnus and former Sparty Mascot! ), Jehuu Caulcrick, and Justin Hanft. Kevin Sixbey introduced Jehuu Caulcrick, Coordinator, Dream It Do It WNY and Justin Hanft, Director, Chautauqua County Education Coalition. With support from Cummins Foundation in Indiana, the Chautauqua County Chamber of Commerce has been able to move this program forward and partner with local schools. The main reason for CCEC is to observe what else is being done throughout the country and ensure those programs and ideas could be replicated here in Chautauqua County and Western New York. 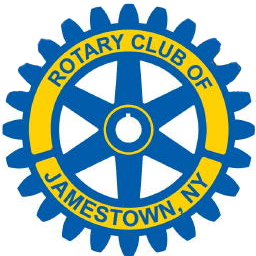 The CCEC represents 60 different organizations in Chautauqua County. The CCEC brings everyone together to have cross communication and to foster greater collaboration in the county. The process is a structured coordinated approach that is data driven to better the youth of Western New York. The Mission of the Chautauqua County Education Coalition is to align resources and build capabilities to meet the evolving workforce requirements of the community. Benchmark and improve kindergarten readiness. Coordinate and align offerings of cohort training for immediate and demand occupations in the health care and manufacturing economy. Justin also shared a sample curriculum review process that CCEC and JCC partnered on. The sample he used was for a career path in Industrial Equipment Technology. It was identified that we need more of these jobs to meet the current demand. The purpose of the project was to identify a challenge or goal and develop a shared measurement system between JCC and the CCEC to gauge the effectiveness of the program. Ultimately, the goal is to examine feedback from local employers and continue to match curricula to the needs of local employers. Jehuu did not need an introduction as most in the room knew of his accomplishments in local high school, college and professional football. Jehuu knew he always wanted to come back to the blue-collar mentality of Chautauqua County and be a positive role model for the area’s youth. The Dream It Do It program’s goal is to attract, develop and engage talent in WNY. We have over 1600 manufacturers and over 68,000 people are employed in manufacturing jobs in Western New York. The challenge and opportunity we are facing is there will be over 17,000 jobs in manufacturing in WNY by 2020. 82% of Americans believe the United States should further invest in manufacturing. Another interesting stat was that only 1 out of 3 parents would encourage their children to pursue a career in manufacturing. This is a perception that needs to change, Jehuu stated. Manufacturing in the 21st century is all advanced manufacturing – very technical in nature. Dream It Do It Western New York is proactively responding to the workforce challenges faced by manufacturers. The Dream It Do It mission is to increase the skilled workforce pipeline entering manufacturing careers. DIDIWNY is the catalyst organization of the Dream It Do It manufacturing career initiative with a vision to provide Allegany County, Cattaraugus, Chautauqua, Erie and Niagara manufacturers with a labor force that has the skill and training levels required to meet their demands. Align Resources: Bringing together key stakeholders within a system that is result driven as well as sustainable, and meets the needs of the employer. Identify Program Development Needs: Through primary, secondary and technical schools, DIDI identifies and advises the development of necessary training and education opportunities that help sustain manufacturing. Implement a Comprehensive Communication Strategy: Through paid advertising, social media and earned media opportunities the Dream It Do It Initiative spreads its message throughout the region promoting a clear understanding of high value, advanced, hi-tech manufacturing and its enormous contribution to innovation, productivity, economic growth, wealth building and high quality jobs. Coordinate Activities: Dream It Do It implements grass roots activities that include: industry tours, manufacturing camps and outreach to school systems. These functions are structured as learning activities that expose young people to the world of manufacturing. For more information on the Dream It Do It program, please visit their web site: www.didiwny.com.